As a beginner you are vulnerable to bundles of misinformation more commonly and easily found than good quality information in the fitness industry. Usually it is poor information with a hidden agenda aimed at getting you to buy a shortcut, generic, badly constructed guide that will leave you in no better position than when you started; i.e. a detox tea or celebrity ‘4 hours to no tummy whole body super-mega blitz’, in which they will upsell their equally ineffective fat burning and appetite reducing supplement bundles. See more on fitness fads and what to avoid here. And moreso for men it encompasses a gigantic, veiny, behemoth of a man telling you that you need to get bigger, you will be happy if you are bigger, and you will be more powerful and successful too! Simply buy this guide and forget I’m clearly on performance-enhancing drugs. So, to break away from rubbish, overcomplicated and often inaccurate information, here are our top muscle building tips for beginners! This means you will likely have to work on both your shoulder and hip mobility, and your all round flexibility before increasing the weight on complicated lifts like squats, deadlifts and bench press (compound lifts which all use more than one joint). This will allow you to lift more weight more safely, and reduce your risk of injury. It may also help improve posture, alleviate some aches and pains and improve performance in other sports and active hobbies. Please see more information on injury prevention here, and flexibility routines here and here! You simply do not need to be doing an hour plus, with each set to failure, on one body part per session. As a beginner you can reduce the volume per body part for each session, and increase the amount of times you train that body part per week. This will also stop the debilitating muscle soreness associated with the high volume sessions, which detract from other workouts during the week. Muscle protein synthesis (the building of muscle cells) will only last 24-48 hours after your session, so training once per week means you will be wasting up to 5 days of precious muscle growth time! A lot of the top bodybuilders will be on performance enhancing drugs to enable them to be at the top of their game, which isn’t stopped given many competitions do not test. This means they can sustain protein synthesis for a prolonged period, so can withstand the damage and recover from it, which is experienced with single body part training. See an example beginner’s training split here. 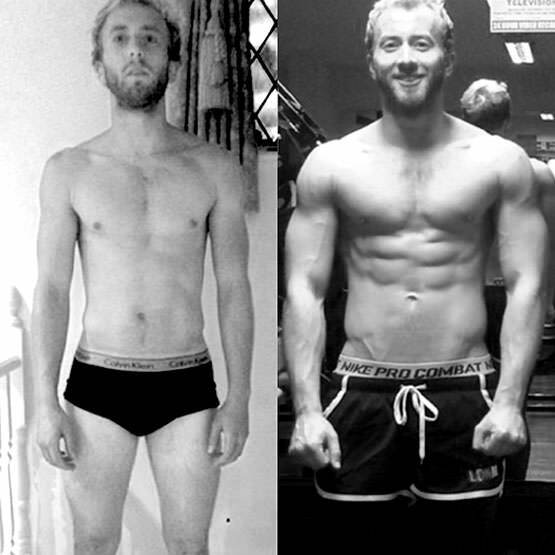 An example of an experienced trainer benefiting from correct volume and frequency of sessions with LDNMuscle. We use the optimal amount of volume and sessions in our LDNM Transformation Guides, which are ideal for both beginners and experienced trainers looking for an educative, detailed and user-friendly guide for their aims! DO NOT GO NO CARB. Stop listening to those suggesting it is the be all and end all to build muscle or to lose fat. Studies have shown that a combination of both protein AND carbs after training allows for better muscle gains vs protein consumption alone, such as a protein shake and nothing else after training! Supplements offer no advantage over a meal in the majority of cases, so concentrate on first honing your diet before considering the inclusion of supplements. Besides, speak to anyone who abstains from carbs or foods they like, and I guarantee the majority of them have massive binges on these foods they wish they included in their diet. See our non-bias overview of what supplements to use for convenience and performance here. Women too can develop lean muscle definition with the correct nutrition and training guidance! If you are not building muscle size, but are increasing the weights lifted and dedicated to training, then you should evaluate your diet. Are you eating enough protein to allow protein synthesis to occur? Are you eating enough carbs before and after your training sessions for performance, growth and repair? Are you consuming at least 20-25% of your calories from fats? Consume 1g of protein for every pound of body weight, and space this out evenly over 4-5 meals. Eat 90-120 minutes before training, and within an hour after your session. Then space the remaining meals out evenly over the rest of the day, generally 3-5 hours apart. Eat at least 20-25% of your daily calories from fats. Fats are 9 calories per gram, whereas protein and carbs are around 4 calories per gram. Eat the majority of your carbs in your pre and post workout meals- around 50-70% dependent on your aims. If you are vegetarian or vegan, aim to source at least 15-20g of protein at each meal, and supplement this with a serving of leucine. Replace the lost calories from the lack of protein with either carbs, fats or both. The key points here are to eat enough calories, then slowly up your protein across each meal. Then you can start adjusting fat and carb amounts and timings to suit your dietary preferences and for optimal growth and performance. A revelation to many, and a point many leading fitness trainers will refuse to consider: the fact that you can include traditionally ‘bad foods’ in your diet daily and progress towards your goals- be these muscle gain or fat loss! A good rule to follow is sourcing at least 80% of your food from good, wholesome foods, and including up to 20% of your calories from perceived bad/junk or simply not as universally healthy foods. This method of dieting increases the longevity of a diet, and increases your chance of long term success in results and in regards to nutrition- and also means you can avoid foods that you detest! Please see more on flexible dieting here, and more on eating styles including ‘clean eating’ here. We feel flexible dieting allows you to learn more about calories, portion control and eating long term for health, results and most importantly enjoyment and sustainability! If you have any more questions please feel free to tweet them at us @LDN_Muscle, or ask us on Facebook via message. Please see all information about our market-leading transformation guides for both men and women, and which guide is best for you; girls and guys! 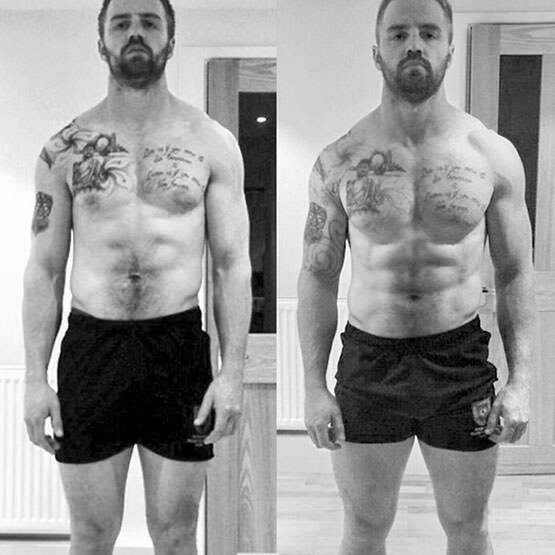 See our galleries for building muscle and losing fat for guys, and our Bikini Guide gallery too for an example of great results with an optimal guide for training, nutrition and anecdotal and evidence-based advice alongside our support! Remember to follow us and post your progress on Instagram, and use the hashtag #LDNMuscle so we can see your lovely creations, repost some and spread the LDNM Community far and wide!